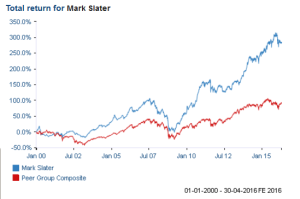 Mark Slater is one of the UK’s leading growth stock investors, whose methods are based on the rigorous criteria laid down by his father Jim Slater in the Zulu Principle and other books. I caught up with Mark at the recent London Investor conference to ask him what opportunities he is currently finding in the equity market. JD I’d like to start by asking you where you think we are in the market cycle as far as that’s relevant to your investment process. MS I think that the bull market is pretty long in the tooth. It’s potentially one of the longest in history. I’m very concerned about the lack of growth in the world generally and the profound lack of demand and I also find it very worrying that central banks feel as if they’re all in. They’ve used a lot of their ammunition already. So if there is another recession, we’re very exposed. Having said that, I’m comforted that at last there has been a correction and quite a decent correction. In most developed markets, we’ve had a twenty percent odd correction. I also think that objectively, conditions for equities, at least theoretically, are pretty good. 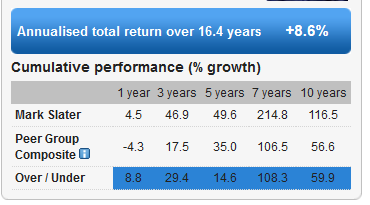 You’ve got low growth, moderate growth and you’ve got very cheap money. And money will remain cheap for a long time. And I’m very conscious that the yields equities offer are still very attractive compared with most other asset classes. Dividend cover is stretched as a headline number, but underneath it all, there are plenty of companies generating three or four percent dividends and they’re very sensibly priced and very sustainable. So the long and short of it for me is I think the risk of being out of the market is probably slightly higher than the risk of being in it, but my biggest concern is growth and there’s clearly pressure there. So what we’re trying to do is to emphasise quality in what we buy. On the general picture, what would actually make you change your mind about the current situation? In other words, either against equities as the best of a poor lot at the moment or possibly a complete change in environment. If, for example, the Fed does start raising interest rates and so on, would that have an impact on you? Well, I think if the Fed raises interest rates for the right reasons then that would mean that the growth side of the equation has improved. So I wouldn’t regard that as terrible news, as long as it doesn’t raise them massively. But if it behaves as it’s been advertising then I think it’s relatively positive. So I’m not overly worried about the Fed. My biggest concern is recession. If there’s recession then suddenly the earnings part of the equation falls apart. Potentially the dividend part of the equation comes under pressure as well. So to me recession is the main risk and there clearly are significant challenges for most business at the moment and the biggest is that there’s just a lack of demand. In the last twenty or thirty years or perhaps forever, it’s been quite easy to point somewhere in the globe or at least point at some sectors and say ‘they’re doing really, really well.’ At the moment it’s hard to see quite where that is. So that’s my biggest concern. Recession will be a game changer. You don’t think, for example, that we will finally get, say, a dividend from the oil price fall that we’ve seen and that will come through and may help a little bit in growth which we haven’t seen so far, it’s been disguised by the environment in which it’s happened? To begin with I thought there’d be a huge benefit in consumer spending. I’d read a number somewhere that thirty dollar oil meant a three trillion dollar transfer from oil producers to consumers, one way or the other. That’s a big number. I think if that were a straightforward number, we’d have seen it already. So I don’t believe we’re going to get it now. Sure, it’s helpful to corporates that energy’s cheap and it’s still cheap but I think the oil equation is much more nuanced. So my view is that yes, it’s good news for lots of people, but there’s a bad news side of it too. In America, fracking expenditure was a massive part of GDP growth, that’s now gone into reverse. But I think that’s taken a lot of the benefit away in the States. In the UK, obviously the North Sea has pretty well fallen apart. It’s not a huge part of the economy so I’m surprised we haven’t seen more benefit here but equally I don’t expect it now. I think if it was going to happen, it would have happened already. So against this background, turning to what you actually do which is you pick large equity portfolios, you’re looking for companies that are profitable and can grow that profitability and fortunately you don’t have to buy the whole market, you can be very selective. Are you finding a lot of opportunities first of all at the moment? Not a lot but enough. I think the key test for us of a market, is as long as you can find the occasional new name, you should be quite happy. So it’s challenging but there are enough companies out there that meet our criteria to make me reasonably happy about things. Do these tend to be very small companies or mid cap, small cap? I would say the larger the better in the sense that it’s always easier when they’re big. The problem we have found recently is that when you do find a company growing even at mid-single digit percentages, six, seven, eight percent, they’re typically the Compasses of this world, the Bunzls of this world. They’re great businesses but they’re all on twenty plus times earnings. And to me it’s a lot to pay for that level of growth. So we’re typically – and this has been the case for a little while – finding many more opportunities amongst smaller, often more ‘nichey’ businesses that are lower down the scale. Can you give me a couple of examples of things you bought recently or have been topping up recently? Sure. 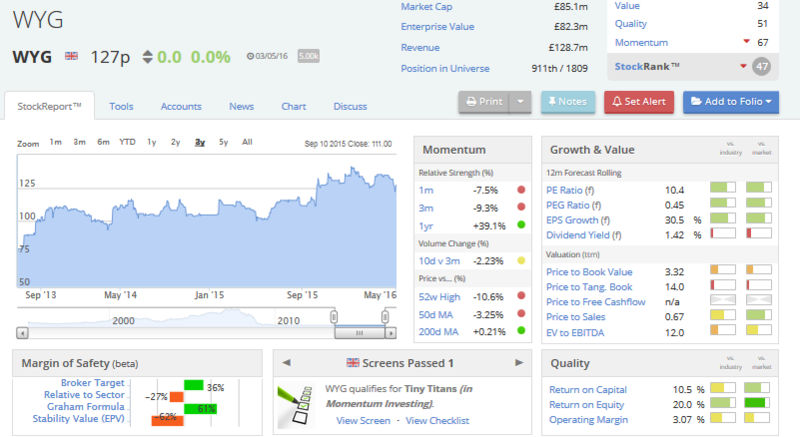 There’s a company called WYG which is a consultancy business. It’s a project management type business. Very well managed, great delivery on all the key metrics that they’ve set. 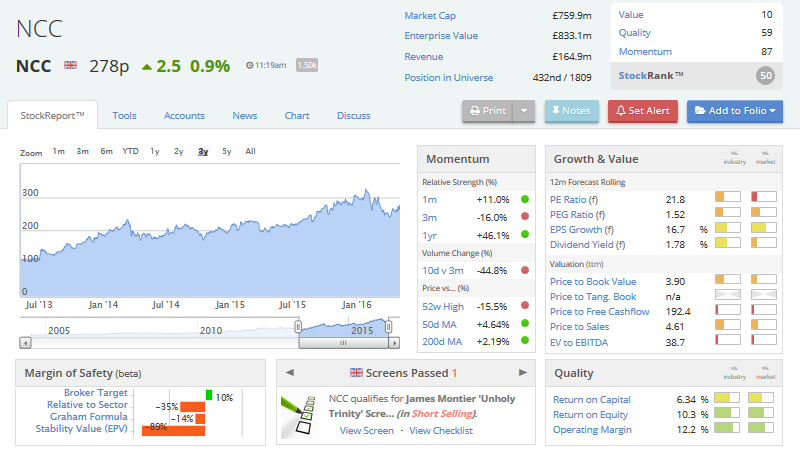 It’s got great visibility at the moment, great order book, lots of momentum in its core markets and it’s trading on just under nine and a half times earnings with good growth, a good balance sheet. And what we like as well is that management are guiding to a number for February 2018 which is around a third higher than market forecasts. And given their propensity to exceed forecast, I think that the higher numbers are credible. So they’ve got a very low rating in that business, it’s got good momentum and it’s got pretty good visibility. So just remind me, what kind of PE ratio is it on? It’s on just under nine and a half at the moment. That’s on the broker forecast? Yes, that’s prospective. That’s for the broker forecast, dropping to closer to eight but the eight could be a lot lower than that assuming management hit their higher number. And another example? I know you’ve mentioned STV – Scottish Television – as a stock you’ve been buying. I think STV are very unpopular these days. Well, television generally is very unpopular and I think unfairly. I think in the UK there’s been some concern about advertising spending being deferred because of the EU referendum. There had been a hope that the second quarter would be a blow out quarter because of some of the programming they have. Perhaps it won’t be now. It may be a bit disappointing. The other issue has been that the US media companies have been de-rated a lot in the last nine months. But I think TV’s underestimated because it’s still the only way of hitting a mass audience. I love the fact that some of the big US tech giants are amongst the big spenders on ITV. Yes, all those guys. They see the benefits of television advertising. 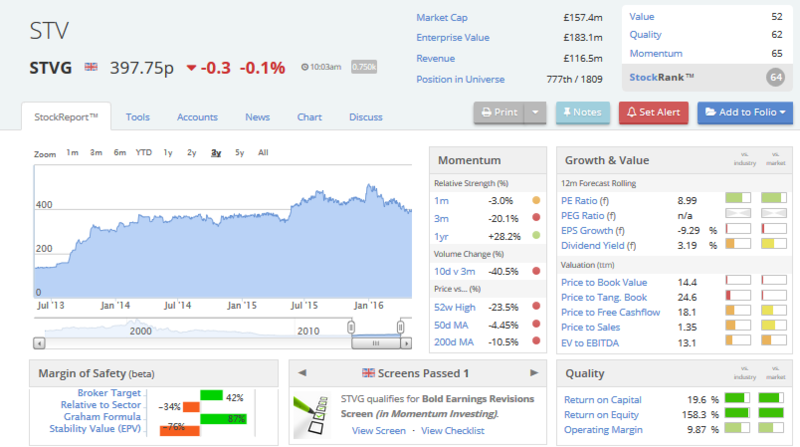 So in the cash of STV, that’s trading on a PE just under nine. It has some debt but that’s come down a lot and they’re very cash generative. The main wrinkle is that there is a pension deficit and it’s not an ideal situation to have a deficit. But they manage it very effectively. They’re very canny about how they manage it. They’re growing around ten percent per annum. It’s a level at which management incentives kick in so there’s a high level of incentive to grow at that rate and there are a lot of good things happening in the business. Their digital offerings which are very high margin are growing very quickly actually. They also have a production arm which is doing quite well. It’s a nice, interesting business, very well managed on a very low rating. So someone might come and take it over, is that a possibility? Well ITV did just buy Ulster TV. So STV is the only ITV affiliate that’s left as an independent entity. There’s always a chance of that but given the political sensitivities in Scotland, I wouldn’t bank on it. But another big driver which is, I think, very important is the changing framework around the BBC and about the way in which media generally is governed in the UK. And we’ll hear on that soon – I think it’s the end of the second quarter we’re going to hear more on that from the government. At some point I also believe the retransmission fees will be charged whereby at the moment the ITV network cannot charge for its main channels being shown on Sky and Virgin and those sorts of companies. Which is unfair. It is an anomaly really. Yes. The legislation was drafted a long time ago so it’s very out of date and I think it will be updated. STV is the most geared company to benefit. It could benefit – the biggest number I’ve seen, in the event that they can charge one pound per month per subscriber, there’s something like a seventy percent benefit to earnings. Well that’s huge for a business on a sub-nine multiple. More likely it’ll be much more complicated, there’ll be some benefit, they’ll probably have to promise to put more money into programming and all the rest of it. So there won’t be a straightforward increase in earnings coming their way but there will be a benefit I think. And that’s fairly soon. So it’s a nice additional driver, on top of everything else. Have you thought about buying ITV itself? I own ITV and I have bought a few of those recently. It’s come off quite a long way. Yes, it’s come off quite a bit and I think that all the same reasons for STV apply to ITV. The rating’s a bit higher but so is its cash generation, it’s a bigger, more robust business with a better balance sheet. And you’ve also got the corporate angle with ITV because Liberty have a ten percent holding which could easily be increased. It’s a strategic asset for somebody in addition to the fact that it’s growing nicely. It’s on about twelve times earnings which isn’t expensive for a cash generative business. Yes, there’s life in the old dog yet. Give me an example of a technology company because that’s an area where you also invest but very selectively. It’s a big trap for lots of people because technology companies always look exciting and often turn out to be very disappointing for whatever reason? No, absolutely. We only invest in businesses that make money and have a track record of profitability. So that rules out a lot of the whizz bang sort of stuff. It tends to be more bang than whizz. But for instance, one of our very long standing holdings is a company called NCC which is the leading IT security business in Europe. We’ve bought more of those quite recently because they came down a bit lately. They were dragged down by quite a big derating in the IT security space in the US which got very frothy a while back. But NCC’s never really been frothy. Today it’s trading at about twenty-one times earnings which is, you could argue, high-ish. But it’s growing at fifteen percent plus. And what we like is this sort of wonderful tail wind. In a world where growth is uncertain, this is an industry which has literally a free advert every single day of the week where someone, somewhere is being hacked. It’s become a priority area for all businesses. They have to deal with it. And it’s not going to go away. It’s like healthcare. You have to maintain health, you have to maintain online security as well. And they’ve got the best market position? They’re dominant in the UK and Europe. They’re the biggest employer of the top-end IT people. Their UK office is in Cheltenham basically opposite GCHQ. A lot of their people come from GCHQ. So it’s a well-managed business. We’ve owned them for many, many years and they’ve delivered very nicely. So we like it. But that’s on quite a high rating, twenty-one times? Quite a high rating but with fifteen percent plus growth. That is, these days, pretty good. And strategically very well placed. So I think they’re set fair for quite a long time. Last question, Mark. You’ve been involved recently in a rather high profile corporate governance case which has taught you some interesting lessons I think? And you’ve won that case, you’ve managed to win a vote against the board of the Lakehouse Group. Without going into all the tedious details of that, does that tell us good things or bad things about the way that companies are governed in this country? I have to say I’m fairly depressed about governance generally and I think it’s brought home to me how important it is to be invested in businesses where you haven’t got those issues. Governance becomes relevant when there’s a problem. If there’s no problem, you don’t have to worry about it. So the most important thing is to be in businesses which don’t have problems. That’s the first lesson to me. The second lesson is when there is a problem, governance matters. And I think that’s where I’m depressed. So on remuneration, the companies that offend tend to be serial offenders. Nothing changes. I think in the case of Lakehouse, my view is we should never have got to the point where an EGM was necessary and there should have an accommodation which we weren’t able to reach and the company in our view never had a winning scenario. They couldn’t win. Because even if the board gets a fifty two percent vote, you’ve still got a forty eight percent block against you which means you can’t issue shares, potentially. There’s a tank on the lawn. You have to engage. You have to deal. That doesn’t mean you have to roll over completely but you have to deal. In this instance, we believe the company never had a winning scenario and for reasons we don’t understand and for reasons which the directors have not been able to explain to me, it’s a complete mystery it seems to everybody why it was fought to the wire. To me it’s very sad. I think it also brought home to me how hard it is to affect change. Calling an EGM and actually managing the process, you’re up against a company which I think in this case, in the case of Lakehouse, hired two proxy agents, PR – and it was a full-time effort on behalf of the business. It wasn’t our full- time job. So it was a huge effort to have to keep on top of that and push it through. And most shareholders are simply not prepared to put that effort in. I guess the long and the short of it is that the reasons I’m depressed by corporate governance are; one, on remuneration and two, on general governance like EGMs. Most directors, most non-executives aren’t prepared to be tough and put the nervous energy in that’s required to do the right thing, for instance with remuneration or whatever. And second, most shareholders aren’t either because it’s really hard. And given how hard it is, I think a lot of aspects of shareholder democracy are very weak. And so therefore as an investor, you’re led back to the conclusion you really have to study management very carefully before you get involved basically because you don’t want to get involved in these situations if you can possibly avoid it. Avoid the problems, yes. Which I kind of knew before but I know it a bit better now. On that note, Mark, thank you very much. I really appreciate your time. 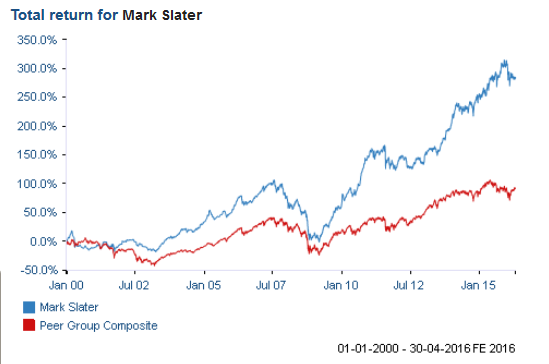 Mark Slater co-founded Slater Investments, the specialist UK equity fund manager, in 1994. The company manages a hedge fund, three unit trusts and portfolios for large pension schemes and high net worth individuals. 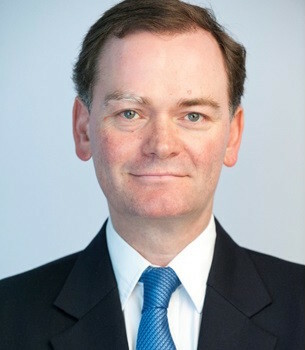 Mark is Chairman and Chief Investment Officer.